On their tour from the Balkans to the Baltic, Kevin Rushby and family arrive in Albania – once unreachable, now scruffy, eccentric and entirely lovable. As soon as we cross the border into northern Albania, near Shkodër, we are faced with a decision: coast or mountain? 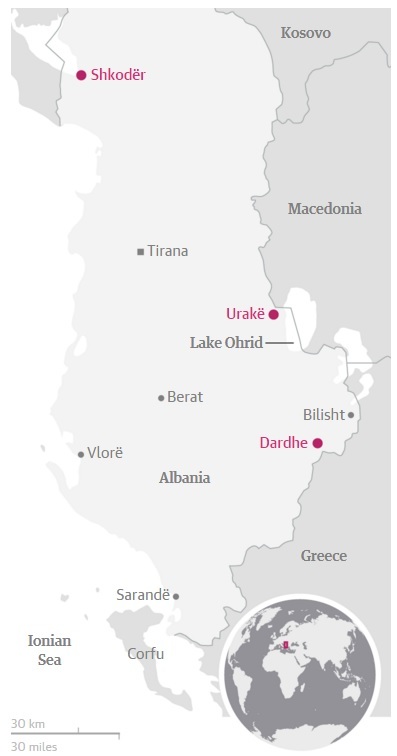 I’ve wanted to visit Albania since the 1990s, when I glimpsed its then unreachable coast from Corfu and heard it was the loveliest in the Med. But we’ve arrived in a heatwave – 40C-plus – so turn towards the cool mountains of the south-east. After well-groomed Croatia and Montenegro, Albania appears as shaggy and ill-kempt as a lovable hound, all dirty paws and enthusiastic tail. After a night at a wayside hotel, we continue south, turning off the main road at Urakë to explore. Our guidebook says there are Illyrian tombs near a village called Selca. The road becomes a track and divides. We stop to ask directions and at this moment we finally arrive in Albania. The man speaks a lot and waves his arms. I’d guess we are getting 90% Albanian and a smattering of other European tongues, none of them English. Albanian is seriously different from any other living language, but speaking it quickly to foreigners will, it is widely believed, make it perfectly comprehensible. This man, we gather, advises taking the left fork. We do so, and within a mile he is proved correct. Away to our right is a magnificent ancient bridge, spanning the river in two impressive and wildly uneven arcs of stone. A youth appears on a horse with a wooden saddle. “Via Egnatia,” he says, pointing at the bridge excitedly. “Old!” This is an understatement. The Via Egnatia was constructed in the third century BC, probably on top of an earlier road, the only land link between the eastern and western regions of the Roman empire. Notable feet have trodden its route, including Julius Caesar, the apostle Paul, and many crusaders. There are hopes that its remnants might become a long-distance hiking trail, but for now this bridge is unmarked. We only have the youth and his horse, which we lead over the cobbled arches that have supported so many travellers. Resuming our search for the tombs, we meet an old man on a donkey who feeds us wild plums and points out the bee-eaters nesting in a mud bank. Only it’s not the birds he’s pointing to, but the dark blobs of cave entrances on the next hill. A third-century BC Illyrian king, Monum, is supposed to be buried here. We tramp around, finding three tombs in the rock, long since emptied of all treasure, much to the disappointment of Maddy, 12. 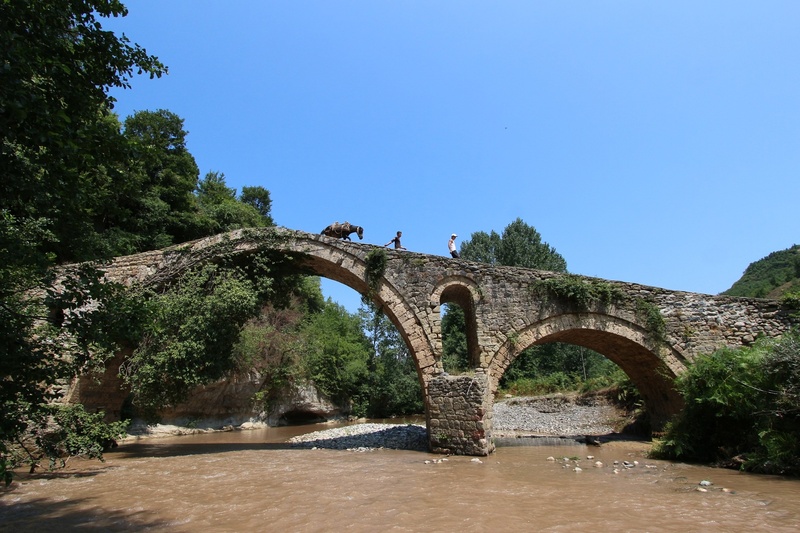 An ancient bridge on the even more ancient Via Egnatia. Rosa shows us through a gateway to her shady terrace by the lake, where her rowing boat is hauled up. She pours us a tot of raki and fetches a bowl of fresh figs. There is never any doubt we will stay: the only question is for how many years. We eat a lunch of koran, a sort of trout and one of seven fish species that haunt the deeper zones of the lake. Later we swim and explore the rest of the promontory, where there is a ruined fifth-century church with mosaics of peacocks eating luscious bunches of grapes. 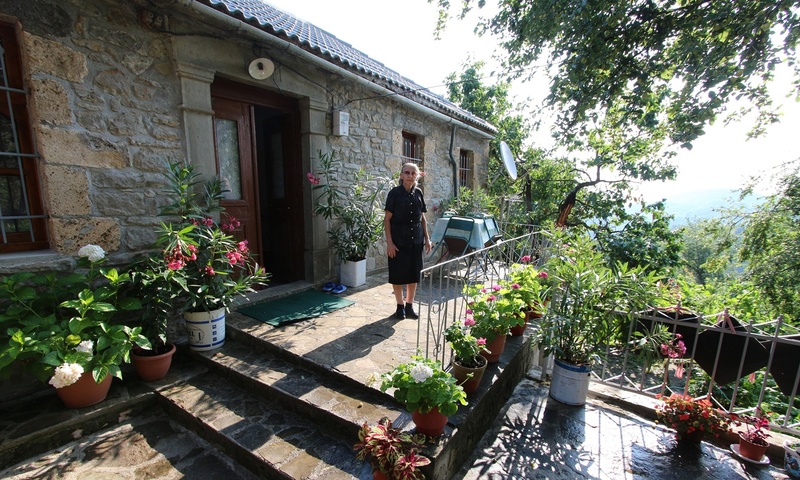 Floria in the garden at her homestay in the village of Dardhe. We leave, reluctantly, next day and drive into the mountains on the Greek border, reaching Dardhe, once an important trading post but now largely abandoned. Some of the fine stone houses are being restored, as is the road – clearly there are big plans for Dardhe – but we amble out on a footpath and eventually come to a house with a sign. Is it a B&B? We can’t decide. A man appears from inside and tells us in halting English that Floria, his mother, is offering a room, but wants us to understand she will not be making lakror today – though the nearby tavern will have it. Again, there is no doubt we will stay. At the tavern, home to a stuffed lynx but no wolves, the waiter fills our water carafes from a gushing spring and we order lakror, not knowing what to expect. After an hour he returns with a wooden block, clears a vast space, then brings out an iron pan the size of a cartwheel and lays it proudly on the table. “Lakror,” he announces. Lakror, it turns out, is a local speciality, a bit like a Turkish börek – a flat pie stuffed with cheese and vegetables and utterly delicious. Which is fortunate, as we are eating it for the next two days. When we leave, Floria is heartbroken that we have not tried her lakror, but we promise to return. After all, we have fallen deeply for this shabby, hugely eccentric gem called Shqipëri by its inhabitants, and Albania by everyone else.